Boots might sound like unnecessary dog gear – after all, wolves go barefoot, right? Well, we’ve found that in certain situations (sharp gravel, fire ants, barnacles, hot pavement), it’s a choice between boots and hurt feet, so we went hunting for the perfect pad protection. 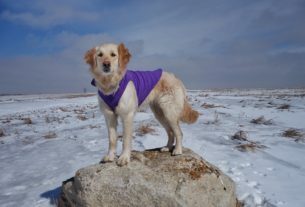 We’ve tried five brands so far, from $12 to $60, so we were excited when DogsThatHike offered us the chance to test out these mid-priced sturdy boots from MyBusyDog. MyBusyDog waterproof booties come in eight sizes from 1.5″ to 3.25″ (very similar to Ruffwear boot sizes), in orange, green, black and red, and they’re $35.99 on Amazon. Up front, I liked the bright color options and all the sizes, but disliked the 4-pack: almost all of the other brands we’ve tried come in pairs or singles. It’s bad news if your dog has different sized feet, like Robin, or if you happen to lose one. 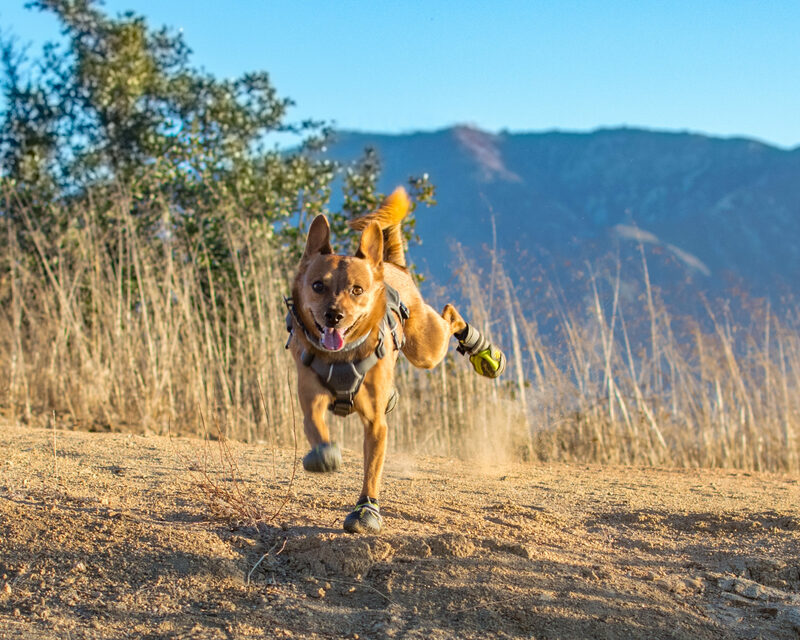 For a trail boot priced around 50% of the similar Ruffwear and Hurtta options, the MyBusyDog boots are extremely well made. They feature vinyl toe caps and side-of-foot stabilizers, durable construction and sturdy stitching. The soles on these are the thickest of all the soled boots we’ve tried (which isn’t my preference, but definitely adds longevity); Hurtta Outbacks are quite soft and Ruffwear Summit Trex are somewhere in the middle. The uppers are flexible, made of a smooth fabric with a slightly fleecy lining that’s similar to the Outbacks. These were the first boots we tried with a front gusset (Ruffwear’s breathable Grip Trex have one too) and while it makes the boots faster to put on, they are also fussier to adjust and on Robin’s already skinny ankles, there’s quite a bit of extra fabric bulk. These boots feature an upper wraparound reflective strap and a lower webbing one (right at Robin’s dew claw level) that doubles back to easily cinch down the boot. The straps are super effective – the hook-and-loop stays put and Robin didn’t kick any of them off, ever – a first for molded-style boots. However, I wish the top strap were the double-back one to avoid tightening over the dew claw, or that the straps had a bit of elastic for give, like our everyday boots (DogBooties). I really like that both straps have reflectors (even if you’re not out at night, they can make a dropped boot easier to find) and the top strap is long enough to wrap around the back of the foot as well. 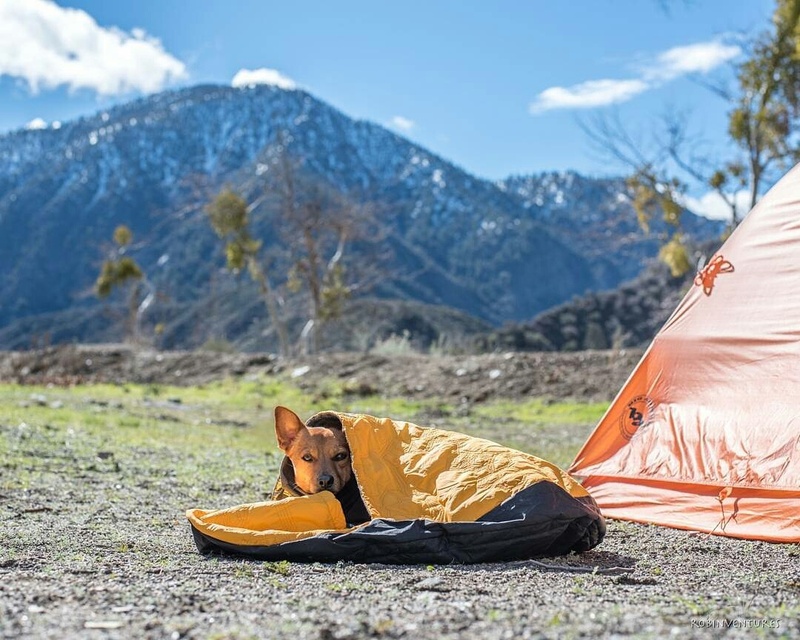 Waterproofness is a selling point, but here’s a caution: dogs sweat through their pads, so to prevent overheating, more ventilation is better. Additionally, waterproof boots can collect water and cause blisters if they get submerged in a stream or puddle. These boots make a ton of sense for winter, since they have a strap right at the top to seal out snow on the trail, and they’ll protect paws from salts on the road. They’re also perfect for rainy day walks when you just don’t want to towel off dirty paws, and I could see using them to protect working and service dogs from chemicals or oily surfaces. However, for summer trail use, especially in our warm climate, they’re not a smart choice. A good fit is ALWAYS important in boots, but I’d argue it’s extra important for small feet, since the wiggle room is a significant percentage of the foot width. Properly fitted, Robin would be a 1.5″ (or less) in the back and a 1.8″ in front. Because MyBusyDog doesn’t do custom sets, we went with four in 1.8″. The flexible uppers and super-sticky straps made it possible to cinch down the boots for a snug fit (we use socks for cushioning), and he never threw any of the four, even though the clownish back boots look clumsy. We did have problems with the boots flipping during zoomies, which would cause the socks to work off inside the boot. 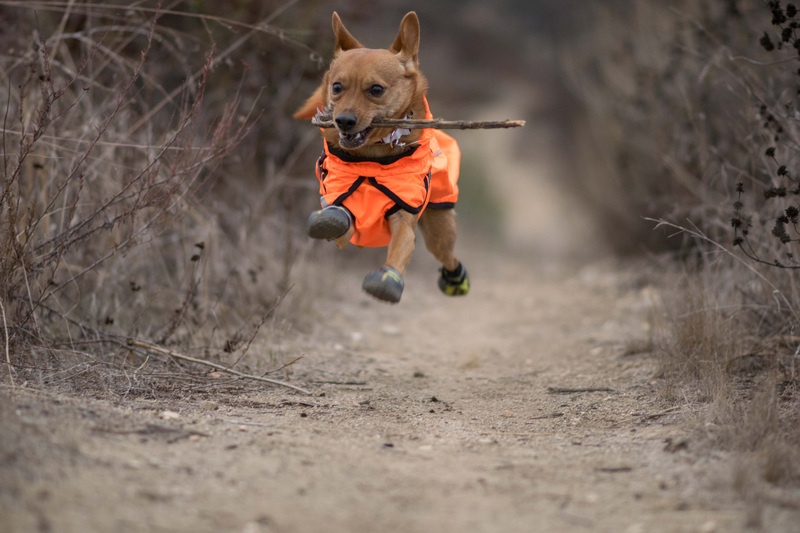 Robin turns into a crazy dog with boots on, and these were no exception – each time I put them on, he started tearing around like his feet had wings. However, he quickly started to become irritated with the boots in a way that we haven’t seen with the other rubber-soled boots we’ve tried – he would run ahead, stop, and lie down until I passed him. He knows not to tear off boots with his teeth, but for a dog that never lies down before we’ve gone seven or eight miles, it’s very out-of-character. The moment I took the boots off, he went crazy licking his feet, which makes me suspect that he finds them very uncomfortable. While moving, though, the boots didn’t get in his way – despite the size issue, I never saw him slip or trip. Because Robin wasn’t a big fan, we didn’t put a lot of miles on these, but they have a very durable construction, on par with the also-weatherproof Hurtta Outbacks boots we tried. The fabrics are tough and the soles wrap up over the sides to help protect the uppers. I really feel like the cheesy logo (and the four-pack) is the only thing holding them back from being high-end- they’re definitely rugged and made to last through many miles. 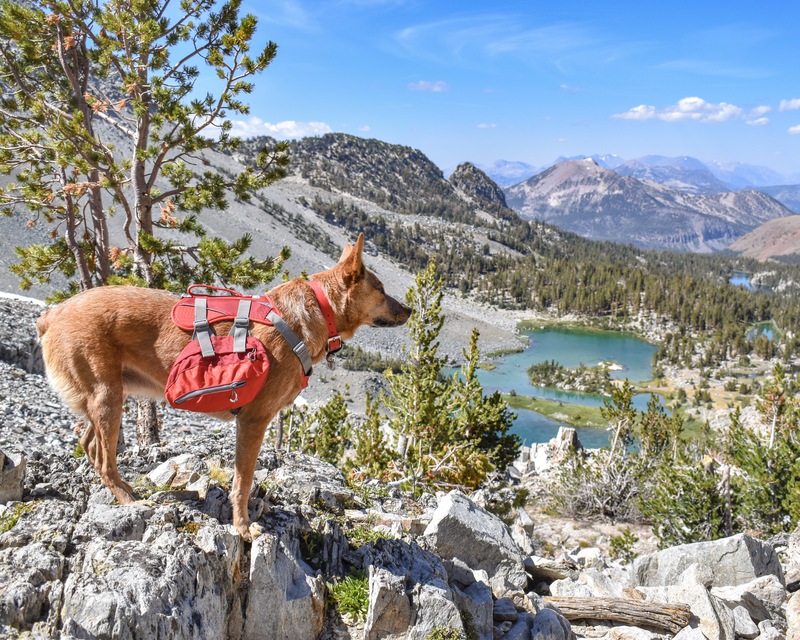 The MyBusyDog boots surpassed my expectations for design and build quality, but because of their waterproof construction, I can’t recommend them for three-season hiking. I do think their strap design makes them a great snow boot option, and the waterproofness is a good feature for rainy day walks and working dogs on oily or chemical-covered surfaces. Make sure your dog’s feet are all close to the same size before choosing these. 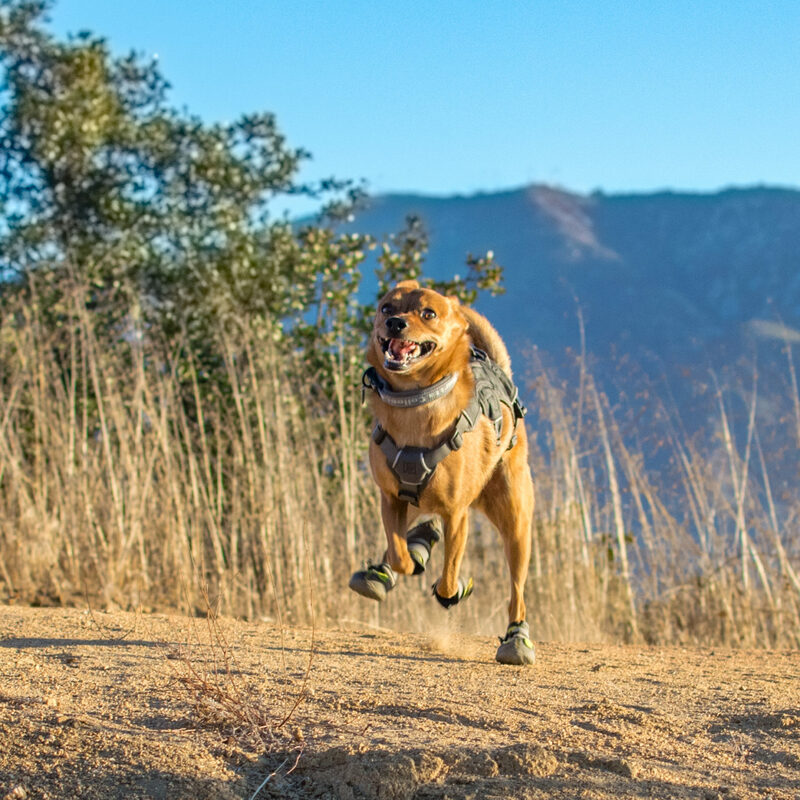 This boot isn’t ideal for: Hot weather, high-impact activity (not breathable), dogs with different sized front and back feet, stream crossings.